Our official launch event is on Tuesday 20th March 2018! We will open our doors to the public and business community so they can look around, explore our services and meet the team. 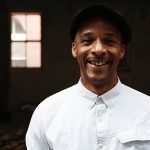 TV celebrity and no-nonsense furniture upcycler Jay Blades, former co-founder of award-winning social enterprise Out of the Dark and a regular on the BBC’s Money for Nothing programme, will be the guest of honour and will highlight the importance of community ventures in creating training, volunteering and employment opportunities. The launch will take place at The Wood Depot, a 10,000 sq ft facility which is currently being transformed from an empty industrial unit into an oasis of creativity and inspiration that will house a wood yard, workshop and retail store for selling recycled products and other gifts from local craftspeople. Mick Moreton, Recycling Supervisor, said: “It has been a very hectic six months getting everything ready, but we are now looking forward to the official opening and welcoming customers and businesses. 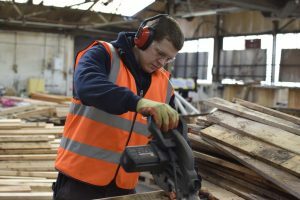 “Wood Saints works on so many fronts…we are making an environmental difference, we are making a social difference and we will hopefully be making a financial difference to all the firms that plan to use us. If your business or organisation is in the building trade or manufacturing, provides training and employability services or works in retail, we’d be delighted to see you at our grand opening. We are also recruiting volunteers and can offer a range of opportunities to learn new skills in wood recycling and basic carpentry. Alternatively, drop in any time to look around from 12 noon to 4.30pm (no registration required).